Unlock Your Wise Mind and Live Your Life on Purpose! Heart Centered Life Coaching Helping You Rediscover the Answers You Already Hold Within ! What do you want your life signature to look like? Sessions can be done by Telephone, Skype, Zoom, or Facebook Messenger Chat. In Phoenix, AZ arrangements can be made to meet in-person to do sessions. Hi there! I am a Habit Change Practitioner and a Life Transformation Coach which means I am a Dreamer of Big Dreams, Guide, and Mentor, here to help others re-discover ways to reach their full potential in life. By connecting with your "wise mind" through Life Transformation Coaching, Hypnotherapy, and other great modalities, you can learn how to align yourself with the life you have always known was waiting for you. You will learn to re-shift and re-frame those limiting thoughts and beliefs that are holding you back from being your authentic self. Everyone carries their own answers deep within yet often have some challenges in figuring out how to bring those answers to the surface of their own life. My business, Spirit Knows Life Coaching, came into existence as a way to honor the uniqueness of each person's path and the knowing we all have within is the Spirit of our own life. Through Life Coaching and/or Hypnotherapy processes I am able to help you find your true inner energy so you can begin living your authentic life! Learn to dream bigger dreams, live more boldly, and be true to who you are at your deepest core. What's stopping you from defining your life possibilities and stepping into your greatness? In the work I do I align with this belief from 1 Thessalonians 5:11 (NIV): "Therefore encourage one another and build each other up, just as in fact you are doing". So take a moment to look around my web-space here and let's team up when you are ready to reclaim your Spirit and begin living your life on purpose! You (the client) understand that intuitive readings, spiritual guidance, coaching, or hypnotherapy sessions are offered for the purpose of your personal or spiritual development, potential healing, or spiritual advisement. These sessions are, in no way, predictive and there are no guaranteed outcomes. You (the client) understand that we are not qualified to answer questions pertaining to medical, psychological, financial, or legal issues. 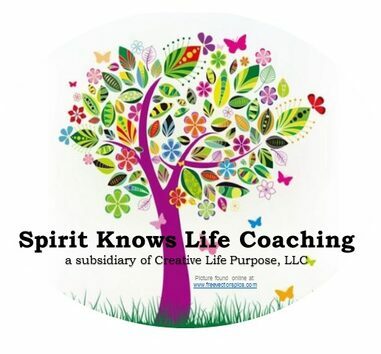 The content of the sessions you (the client) receive from Spirit Knows Life Coaching, a subsidiary of Creative Life Purpose, is subject to your own interpretation, and in no way constitutes, nor is intended to replace psychological, medical, financial, business, legal, or other advice.